Still One of the Best Locations to Fish Currently. Denny Smithgall fished with Doug Dolan for this beast of a ‘bow! Still one of the best locations to fish currently. 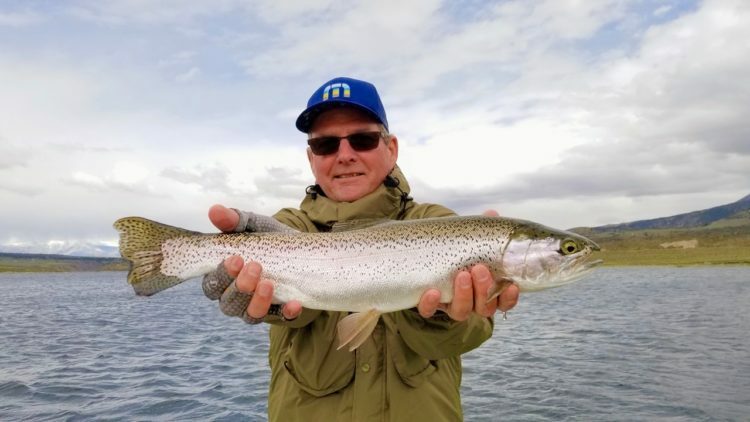 Good numbers of smaller browns and rainbows in Hilton Bays, Beaver Cove, and Whiskey Bay. Green Banks, Big Weed, and Sandy Point giving up some quality fish. Best off of the mud bottom in 7-21′. Fish feeding on the surface on midges and callibaetis nymphs throughout the day. Perch have been mixed in heavy at times. 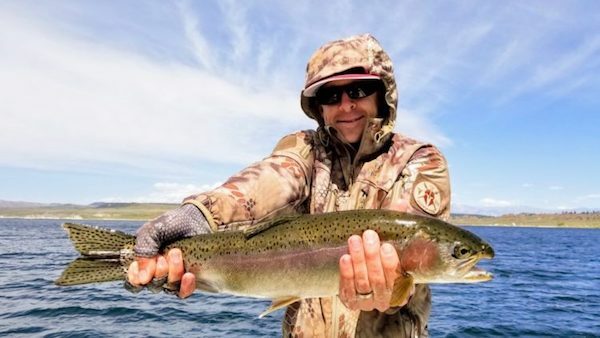 Windy afternoons have not affected the bite, as the fish have been feeding through 25 mph gusts. Some areas will shut down during these conditions so make some moves to stay on the fish. #16-18 Parallel Assassins Light and Dark, #16 Copper Tigers, #18 Zebras, and #20 Gillies have been hot bugs. Jennifer Smithgall under the guidance of Jerry with a football sized rainbow! 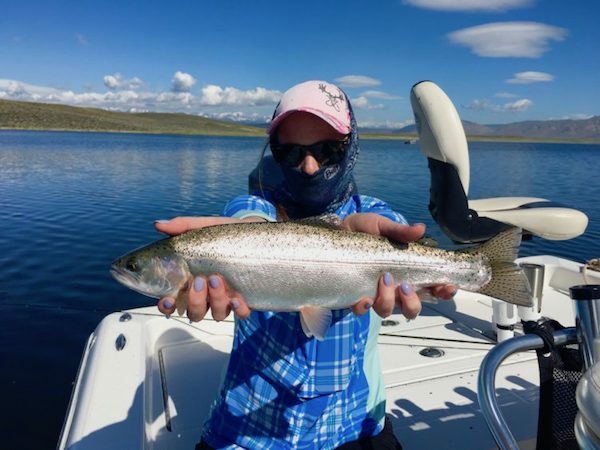 Bree Skeslien scored this nice rainbow while on the family trip with Jerry! 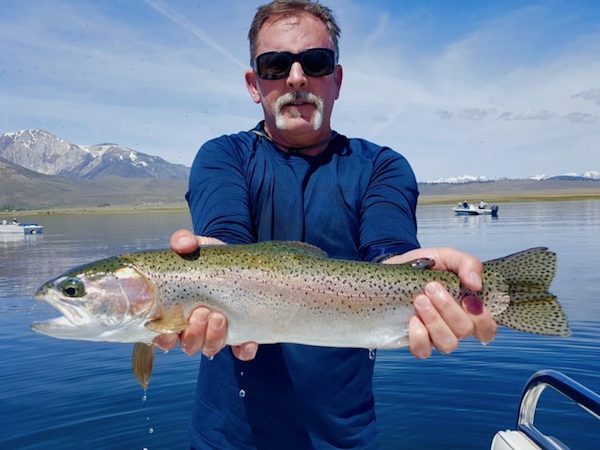 Denny Smithgall with another great rainbow while fishing with Doug Dolan! 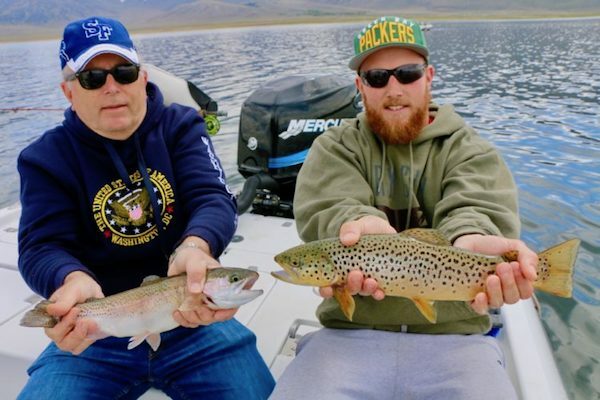 Eric and dad Tim Donovan fished with Hanzo for this sweet double hook up! 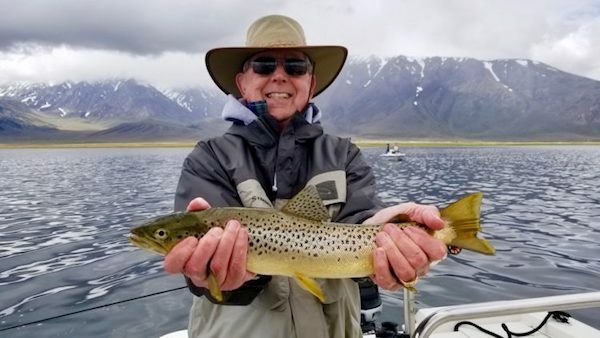 Bill Luehe got this golden colored brown out of McGee Bay! 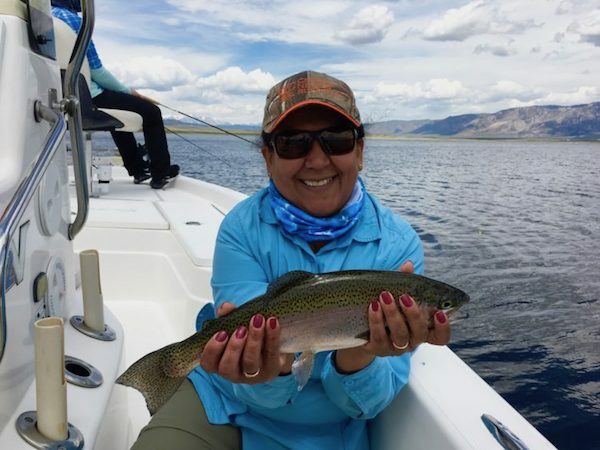 Jerry’s wife Patty also got into the action with this fat rainbow! 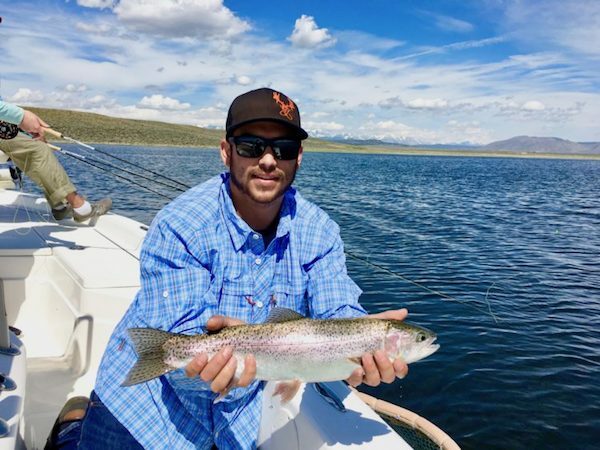 Kevin Conroy Jr. with the long awaited cutthroat trout! 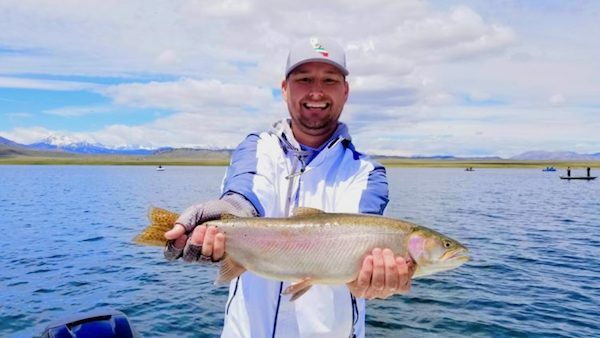 Jerry Gilpin’s son Josh displaying a nice rainbow from a family day on the lake! Bakersfield boy Ivan Bogacki with one of his biggest rainbows to date! 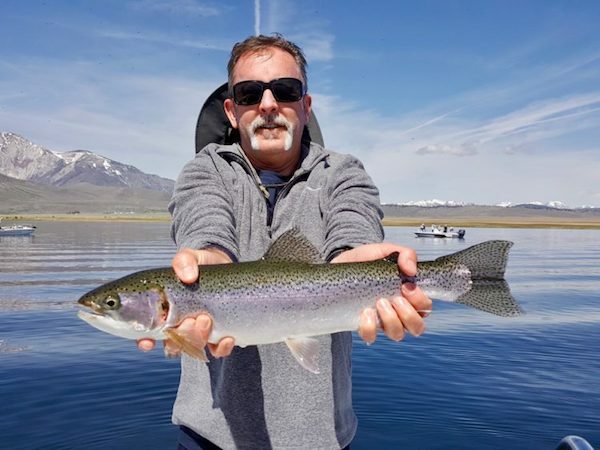 Kevin Conroy Sr. with a healthy rainbow from the depths of Crowley! Owens River - Middle: Flows on the Downward Trend! 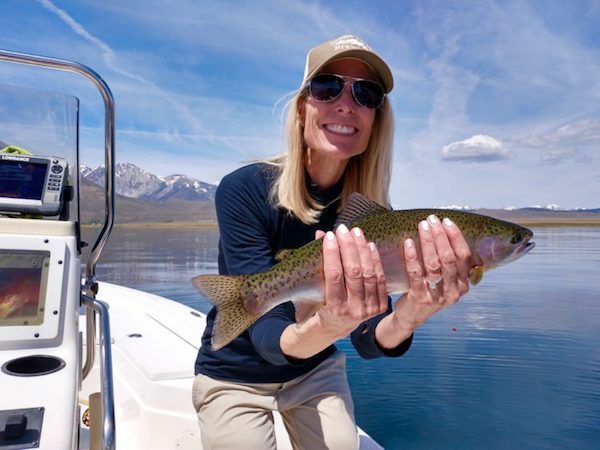 Owens River - Section 3 - Upper (above Crowley): Good Afternoon Dry Fly Action! McGee Creek: Crystal Eggs and Level Leeches! Hot Creek: Fish After Fish on Some Sections of the Creek. 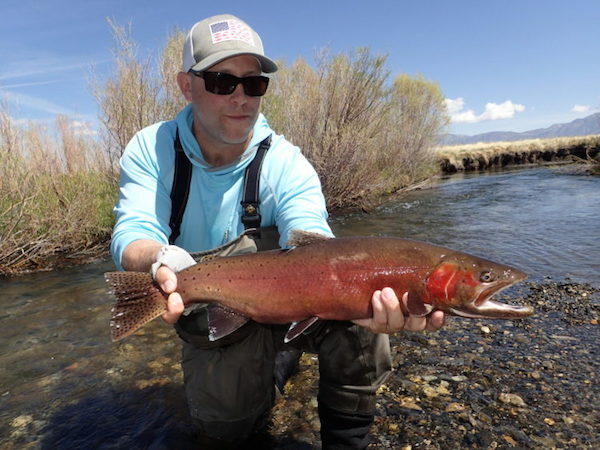 Walker River - East Fork (CA): Flows Now Back to Excellent Fishing!